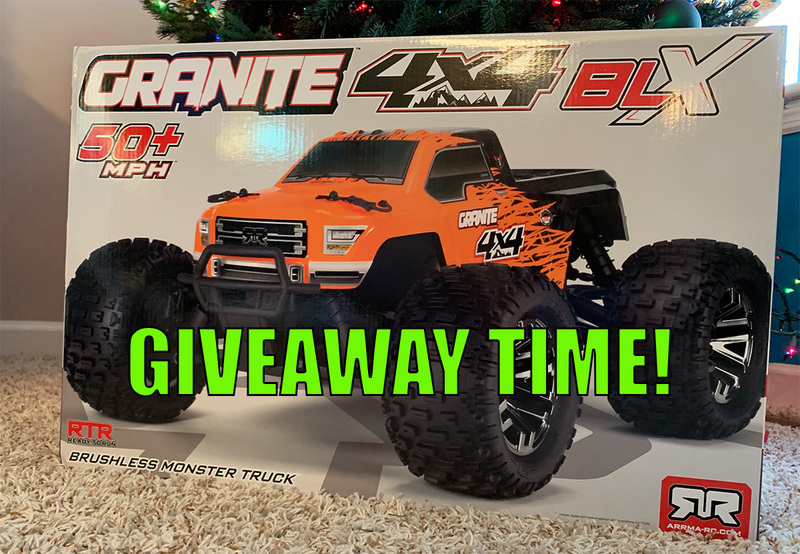 ARRMA GRANITE 3S BLX GIVEAWAY « Big Squid RC – RC Car and Truck News, Reviews, Videos, and More! It’s that time of the year, and we feel like giving! A huge thank you to Horizon Hobby and ARRMA for making this happen. We are giving away a brand new ARRMA GRANITE 4X4 3S BLX Monster Truck! You have seen the unboxing, read the review, and even the post review thoughts! Now you have a chance to win a brand new one, just like the one in the review. You know the drill, it’s pretty easy, we start taking entries into the raffle now, and we will close the raffle on December 23rd, 2018 at midnight cst! We will then announce the winner of the new truck on December 24th 2018. One of our lucky readers will know there is a new truck coming to them for Christmas! The rules are simple, get entries using the raffle tool below. Once the software chooses a winner, you will have 48 hours to respond. If we do not hear back from you, we will choose another random winner. We highly recommend using an actual email you will check once in a while.. especially on the 24th! Besides the Granite we will also hook you up with a Big Squid RC T-shirt to wear when you are out bashing your new truck! And that’s not all! We will also throw in a 2018 Big Squid RC Pin and a load of stickers! We will choose an additional 2 winners for t-shirts, stickers and a pin, and a total of 7 more winners will get stickers and pins! Don’t forget you can earn more entries EVERYDAY! So come back and grab a few more. We were again in the giving mood and have upped the number of entries you can earn each day! Good luck! Go earn those entries! Don’t forget to check out the official Horizon Hobby website or the ARRMA RC site for more ARRMA info!